Learn what causes pink eye, see pink eye pictures and get tips on how to both prevent and cure conjunctivitis. Pink eye occurs when you have an eye infection and the blood vessels on the clear membrane, that covers the white of your eye, dilate and cause your eye to become red or pink. The infection, more properly known as conjunctivitis, can be contagious. 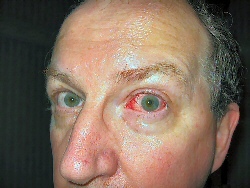 A virus could cause it, for example, or bacteria could get into your eye, making it red, blotchy and painful. Non-contagious forms of pink eye are most often caused by a reaction to something getting into the eye, such as dust or smoke, or you may be allergic to high levels of pollen in the air. Young people are especially prone to eye infections when colds are doing their rounds. Lots of coughing and sniffing spreads viral forms of conjunctivitis quickly. The contagious period for pink eye is usually between 3 and 5 days after diagnosis, but you should check with your doctor, so that your child can be kept at home to prevent infecting other children. While many parents these days tend to be over-protective of their kids and almost over-sanitize the environment around them, what causes pink eye is often simple things like using the same towel or not washing hands properly. So impressing good standards of hygiene on your kids is key. In the case of contact lens wearers, of course, poor hygiene is often a cause of pink eye, together with the use of extended wear contact lenses which can harbor bacteria underneath the lens for long periods of time. If you get pink eye, you should stop wearing your lenses and, if your disposable lenses still have time to run, discard them for a new pair, as cleaning and disinfecting won't necessarily remove all traces of the bacteria that may well have caused the red eye symptoms in the first place. The Rocky Horror show of pink eye pictures can be seen on this red eye page and is enough to make you feel ill as you can see from the picture opposite. Eyedrops - best for bacterial infections. Antibiotic eye cream - again for red eye caused by bacteria. Tip: if a virus is what causes pink eye, then most of the time, it will clear up on its own and there's no point in spending money on special ointment or eye drops. If you suffer from allergies, then allergy eye drops may help treat stinging eyes caused by things like dust or pollen. Similasan Allergy Eye Relief is a good value for money product. You can also take antihistamine tablets, like the ones you take if you suffer from hay fever, as these can help reduce eye inflammation. A good home remedy to soothe pink eye is to lie down in a darkened room and place warm towels over your closed eyes or try some cooling slices of cucumber or some damp tea bags to help soothe stinging eyes. Remember to ALWAYS wash your hands before inserting or taking out contact lenses. Don't share eye makeup like eyeliner or mascara with friends and try to use non allergenic cosmetics that are less likely to irritate your eyes. Be careful at home to NOT share towels with other members of the family, especially if you have a cold. Chlorine can cause conjunctivis and pink eye so wear goggles to protect eyes when swimming. Don't forget to change your contact lens solution EVERY DAY and discard any solution that is more than 90 days old. Now you know what causes pink eye, follow some of the related pages below for additional home treatment suggestions.